This study aims to determine the perception/opinion of the community against the use of recycled ablution water. The study consisted of five stages: (1) identification of water use patterns, barriers to using recycled water, and factors that may interest respondents using recycled water; (2) Preparation of questionnaires based on identification results; (3) Distribution of questionnaires, interviews and socialization at Masjid and Pesantren Daarut Tauhid; (4) Distribution of questionnaires and interviews at Istiqlal Mosque; (5) Data analysis consisting of validation, reliability, and significance test with SPSS and descriptive analysis. There are 200 respondents who participated in this research. The highest average score of acceptance is 3.47 in the Moral obligation question group. It can be concluded that the community's acceptance of using recycled ablution water depends on a sense of moral responsibility to the environment; the greatest influence to accept the recycled ablution water comes from the family; even though respondents' effort to recycle ablution water is less than 50%, but the willingness to use recycled ablution water is high (89%); even the respondents are willing to use recycled ablution water, but the use is limited for specific activity such as watering the plants and the willingness of to use recycled ablution water for ablution is low (only 4.26%). Fatwa Majelis Ulama Indonesia (MUI) Number 2 Year 2010 related to Recycled Water. Madonna, S., Rahmaniar, I., & Nursetyowati, P. (2015). Pengelolaan Air Bekas Wudhu di Lingkungan Kampus Universitas Bakrie Jakarta. Universitas Bakrie. Al Mamun, A., Muyibi, S. A., Razak, N.A. A. (2013). Reuse Potential of Ablution Water from Hum Masjid. Prosiding dalam International Conference on Biotechnology Engineering 2011. Malaysia. PUSPITO SARI, Deffi Ayu et al. Public Reception on the Use of Recycled Ablution Water. Jurnal Darussalam: Jurnal Pendidikan, Komunikasi dan Pemikiran Hukum Islam, [S.l. ], v. 9, n. 2, p. 222-231, apr. 2018. ISSN 2549-4171. Available at: <http://ejournal.iaida.ac.id/index.php/darussalam/article/view/224>. Date accessed: 26 apr. 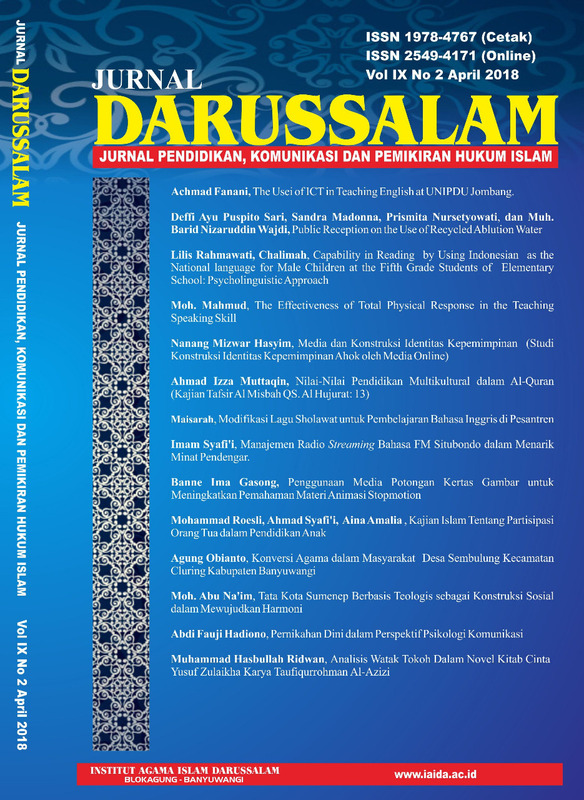 2019. doi: https://doi.org/10.30739/darussalam.v9i2.224. Jurnal Darussalam: Jurnal Pendidikan, Komunikasi dan Pemikiran Hukum Islam by http://ejournal.iaida.ac.id/index.php/darussalam is licensed under a Creative Commons Attribution-ShareAlike 4.0 International License.